Sunday Night Supper... in our house needs to be a simple satisfying meal. Now sometimes this meal occurs in the afternoon, but often it's an evening feel good, relaxed yummy time. 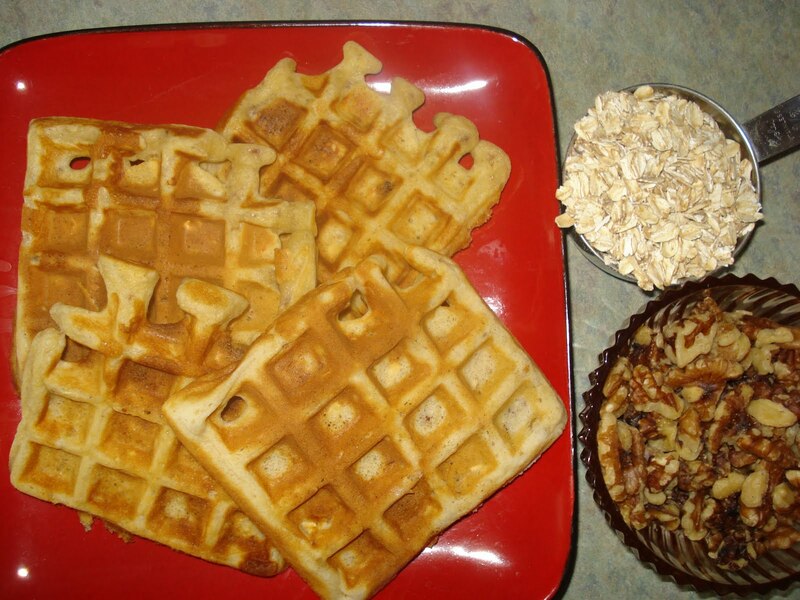 Oatmeal Walnut Waffles. As Sesame Street would say... without *W* waffles would be awful. See, it is a childlike time. Syrup, honey, jam or just hard butter top these aroma beauties and allow the weekend to come to closure. In a medium bowl beat egg yolks until thick and lemon colored. Stir in milk and oil or shortening. Stir dry ingredients into egg mixture. Beat just until dry ingredients are moistened. Beat egg whites until they form soft peaks; carefully fold into batter. For each waffle pour 1 1/3 c batter into preheated waffle iron and spread over grid at once. Bake until done and lightly browned. Sprinkle with cinnamon and add with your favorite topping.